Shakespeare’s star-crossed lovers have been brought to life on the silver screen many times. Which versions are the most worthy of watching? (SPOT.ph) Romeo and Juliet may be the most-adapted play of all time. Shakespeare's timeless tragedy has long been fertile ground for filmmaking as it dramatizes so well the themes of forbidden love, romantic passion, youthful abandon, fate and chance, death and violence. 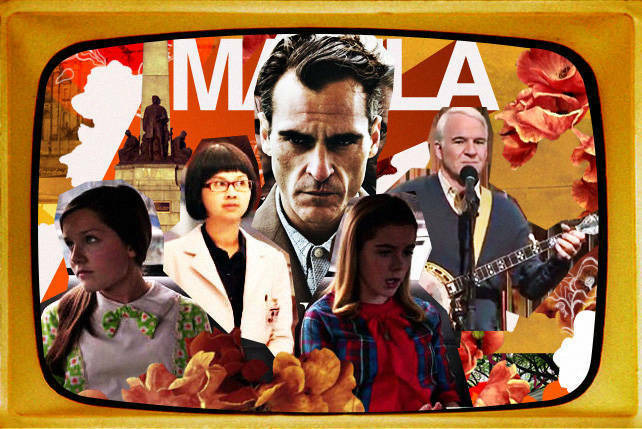 Here, we've ranked our picks for top 10 Romeo and Juliet film adaptations. What is your favorite Romeo and Juliet adaptation? Share it in the comments section below! Juliet (Andrea Del Rosario), a bride-to-be, becomes fast friends with Rome (Mylene Dizon), her wedding planner. As they go through the wedding preparations, their friendship develops into a soulful connection that turns romantic. Conflicts arise when Marc, Juliet's fiancé, discovers what has happened. He calls off the wedding and lets the truth out. Juliet is kicked out of the house by her mother, gets fired from her job as a pre-school teacher, and meets an accident which puts her in a coma. As in Romeo and Juliet, the lovers are kept apart by their families who won't accept their relationship because of the social stigma attached to it, but Rome and Juliet's love survives the obstacles. Loosely based on Romeo and Juliet, Chicken Rice War centers on the fierce competition between rival Chicken Rice hawkers. The two families, who own adjacent Chicken Rice stands, have been feuding for 20 years, with each jealously guarding their secret recipes. Love eventually blooms between the owners' offspring, snooty Audrey Chan (Lum May-yee) and wimpy Fenson Wong (Pierre Png), who get to know each other during a school production of Romeo and Juliet. But can their romance overcome the bitter feud? Shakespeare's epic tale is re-imagined for the 21st century by writer Julian Fellowes (Downton Abbey) and director Carlos Carlei. Fellowes gives it a teen-oriented rewrite that's low on violence and high on heartbreak. Shot on location in Verona, this adaptation boasts of lush settings and excellent production values. Hailee Steinfeld (of True Grit fame) and Douglas Booth are cast as the star-crossed lovers. They're backed by a solid supporting cast, which includes Paul Giamatti as Friar Lawrence, Stellan Skarsgaard as the prince of Verona, Ed Westwick as Tybalt, Lesley Manville as Juliet's Nurse, and Natascha McElhone as Lady Capulet. When eight cadets are left behind at an isolated military high school, the greatest romantic drama ever written seeps out of the classroom and permeates their lives. Director Alan Brown believes that Romeo and Juliet is not just a romantic tale about young love thwarted by a family feud, but is actually a more modern and relevant story about sexual identity and desire pitted against society and its institutions, about personal freedom and rights versus authority. He thought Shakespeare would be a perfect vehicle for exploring gay issues. The military cadets find themselves in all kinds of tumultuous emotional situations-falling in love, losing a friend, confronting homophobia. Incorporating the original text of Romeo and Juliet, YouTube videos, and lip-synched Indie rock music, Private Romeo explores the profound drama of coming-of-age. Shrek 2 director Kelly Asbury gives Romeo and Juliet an offbeat makeover in this 3D animated comedy. Verona Street neighbors Ms. Montague and Mr. Capulet have been feuding for years. The garden gnomes in their respective backyards have taken up their quarrel-red-capped gnomes on one side, blue-capped gnomes on the other. The leader of the reds is Lord Redbrick, while the matriarch of the blues is Lady Bluebury. You probably know what happens next. 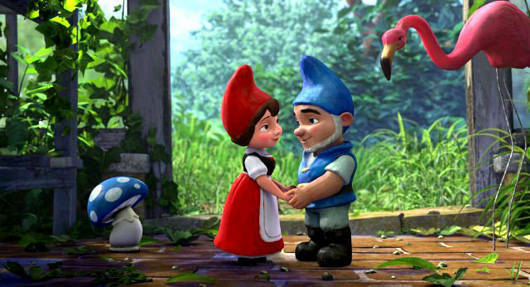 Gnomeo, Lady Bluebury's headstrong son, falls for Juliet, Redbrick's daughter. Featuring the talented voice work of James McAvoy, Emily Blunt, Michael Caine, and Maggie Smith, and a soundtrack filled with producer Elton John's back catalogue, Gnomeo and Juliet is a quirky delight that will introduce the Bard's classic to a new generation. Flamboyant filmmaker Baz Luhrmann updates Romeo and Juliet for the MTV generation. Set in modern-day Verona Beach, this souped-up version opens with a gas station shootout between the Montagues and Capulets, who brandish designer guns (branded as swords) while screaming Shakespearean dialogue. Romeo (Leonardo DiCaprio) takes Ecstasy before he and his friends, including Mercutio as a black disco diva in drag, crash the Capulet's lavish masquerade ball. He quickly falls for Juliet (Claire Danes). In the famous balcony scene, Romeo and Juliet move from the balcony and take a plunge in the swimming pool where they share an underwater kiss. While the film retains the play's original story and dialogue, Luhrmann gives it a hyperkinetic, over-the-top, stylized aesthetic that viewers might find polarizing. Love it or hate it, Romeo + Juliet is anything but dull. The romantic comedy Warm Bodies makes allusions to Romeo and Juliet, although star-crossed lovers R and Julie meet during the zombie apocalypse. R is a walking-dead Romeo who is more soulful and self-aware than other zombies. When R and his fellow zombies attack Julie and her friends, it is love at first sight for R. He rescues her and hides her out in his home, a 747 in an abandoned airport terminal. Julie slowly warms up to her protector and R gradually starts to become more human. Similar to the Montagues and the Capulets, R and Julie belong to warring houses-the zombies and the humans. Julie's father is the leader of the humans. Some characters in the film are also reminiscent of Shakespeare's characters. There's R's best friend, M (Mercutio), Julie's best friend, Nora (Nurse), and boyfriend Perry (Paris). When R sneaks into the humans' fortress to warn Julie of danger, it parallels the balcony scene. Near the end, when they are trapped on the rooftop by sinister skeleton zombies, R and Julie jump to their deaths. R breaks Julie's fall with his body. They both survive and R reverts to being human-a much happier ending than Romeo and Juliet's double suicide. 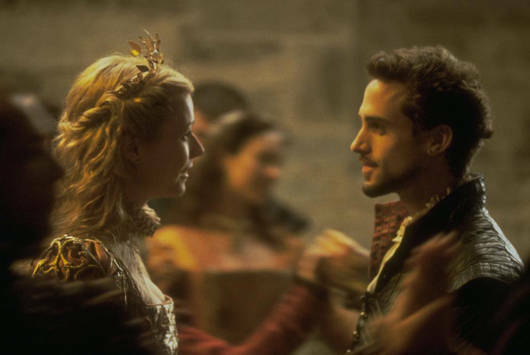 William Shakespeare (Joseph Fiennes) has a bad case of writer's block until he meets the ethereal Viola de Lesseps (Gwyneth Paltrow), who inspires him to write his greatest work. As William and Viola's romance grows in intensity, they find that fate keeps them apart. They are separated by their differences in class and the social obligations imposed on them-Viola is promised to marry a wealthy landowner. The initial comedy William is writing about Romeo and Ethel, the Pirate's Daughter transforms into the tragedy of Romeo and Juliet. Directed by John Madden and written by Marc Norman and Tom Stoppard, this romantic comedy-drama brilliantly interweaves the writing, rehearsal, and production of the play into the plot. 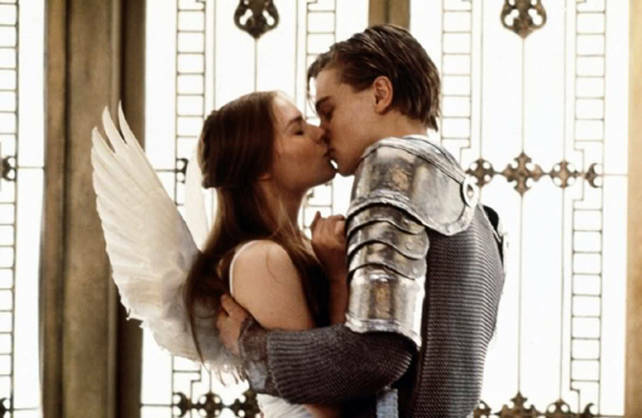 The film also references Romeo and Juliet in the masquerade ball, balcony, and bedroom scenes. Set in New York City's Upper West Side, an ethnic blue-collar neighborhood, the musical West Side Story is a contemporary take on Romeo and Juliet. With a book by Arthur Laurents, music by Leonard Bernstein, lyrics by Stephen Sondheim, and conception and choreography by Jerome Robbins, the original 1957 Broadway production had a very successful run, which spawned the 1961 musical film directed by Robert Wise and Robbins. The film won 10 Academy Awards, including Best Picture. The love story of Romeo and Juliet becomes that of Tony and Maria. The feud between the Montagues and Capulets is recreated in the rivalry between teenage street gangs, the Jets and the Sharks. Tony, a young man from the Jets gang, falls in love with Maria, whose brother, Bernardo, is the Sharks' leader. They keep their love a secret from their families and friends. The balcony scene transpires on the fire escape of a tenement building. 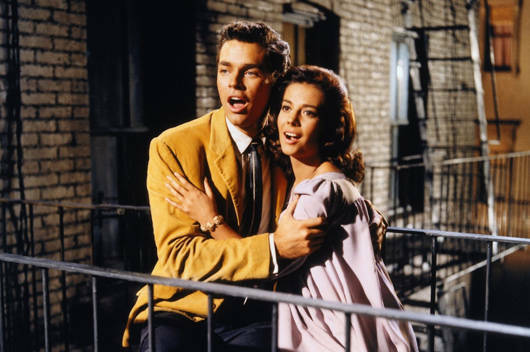 Many of the key characters of West Side Story are based on counterparts in Romeo and Juliet: Anita/Nurse, Riff/Mercutio, Chino/Paris, Bernardo/Tybalt. The ending differs from Romeo and Juliet because Tony dies and Maria lives. But, as in Shakespeare’s play, the tragedy motivates the rival gangs to end their turf war. Florentine director Franco Zefirelli's modern adaptation of Shakespeare's classic presents an exuberant celebration of young love. 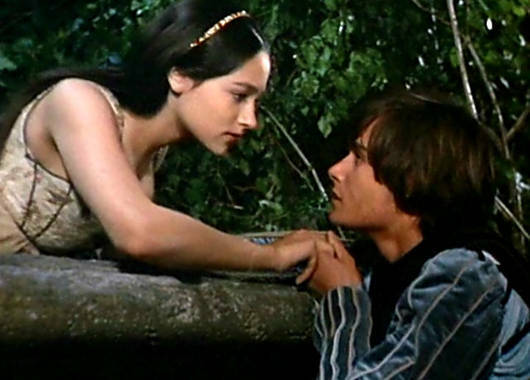 Breaking the tradition of casting older actors for the title roles, he cast unknown, fresh-faced teenage actors: 16-year-old Olivia Hussey as Juliet and 17-year-old Leonard Whiting as Romeo. The beauty, youthfulness and inexperience of the actors work wonderfully in the more passionate and intense scenes and in their natural rendition of the dialogue. Beautifully photographed by Pasqualino DeSantis on various locations in Italy, this is one of the most successful film adaptations of Shakespeare ever produced. Its popular main theme music, composed by Nino Rota, helped to secure its lasting legacy.